I recently had these at a lunch made by Becky Campbell. 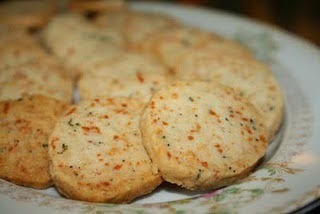 It was a lovely lunch that was light and delicious but my favorite part were the Parmesan and Thyme Crackers. They are simple, tasty and an easy addition to any lunch, dinner or party of any kind! Meanwhile, preheat the oven to 350 degrees F. Cut the log into 3/8-inch-thick rounds with a small, sharp knife and place them on a sheet pan lined with parchment paper. Bake for 22 minutes, until very lightly browned. Rotate the pan once during baking.